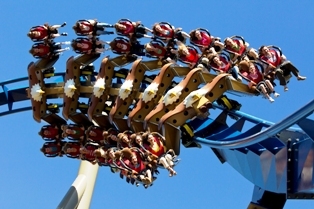 Some of the best amusement parks sit right here in the beautiful Smoky Mountains! We have a unique selection unlike no other! 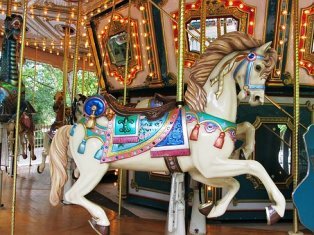 Some of the most popular parks are in Pigeon Forge! There are different kinds of parks to choose from. Whether you like amusement rides, splash rides, go-cart rides, or just fun time parks, you'll find your favorite, or you can do them all! Once you've experienced these recreational playgrounds, you’ll want to come back time and again! These fascinating parks are among a large number of exciting attractions you’ll experience as you visit the Great Smoky Mountains. Everyone loves Dollywood! This amusement park is filled with excitement, but most importantly, they honor God here! There is plenty of singing, dancing, riding, eating, shopping, and just good old fashion fun, however, there is also Christian music, a Southern Gospel Music museum, gospel concerts, and celebrations of Christ (especially during Christmas.) It’s a park that has something for everyone! All those who visit here will come away with an awesome experience. With over thirty-five acres of play area, you’re sure to have a blast! The wave pool is a great way to cool off! Then it’s time plunge down daring water slides, enjoy a relaxing raft ride, and delight in the many other attractions this park has to offer. 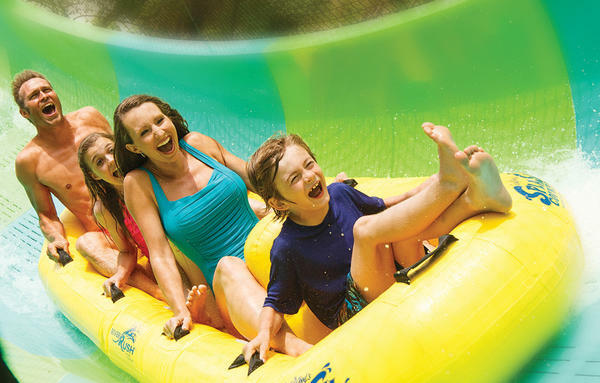 Dollywood Splash Country is a real “scream” filled with plenty of breath-taking excitement! The Ferris Wheel in the photo at the top of this page sits at "The Island!" This one on the left was taken from the "Big Wheel!" The Island is a playground filled with rides (mostly for children), an arcade, restaurants, and a huge shopping area! There's also a fountain of dancing waters surrounded by rocking chairs where most everyone enjoys taking photos, rocking, and just relaxing. 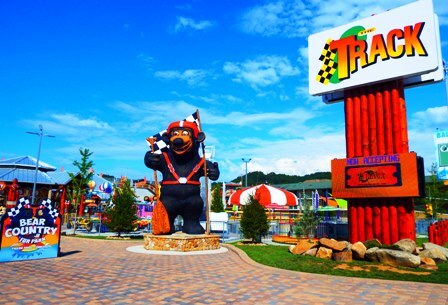 There are several roadside parks along the main strip of Pigeon Forge! These parks, like Fun Stop Action Park is where you'll find go carts, kiddie rides, bungee jumping, and more. If you're looking for fast action, and challenging rides, these fun time parks are the perfect place to be! The Track has two amusement parks in Pigeon Forge. Both have lots of amusements including lots of rides for the kids! There are paddle boats and go carts! Go-carts are popular here, and there are several tracks to choose from. Either fun park is great entertainment for every member of the family. Are you ready to visit an amusement park where you actually see live goats roaming around on the rooftop? That's exactly what's going on here, along with lots of other exciting adventures. 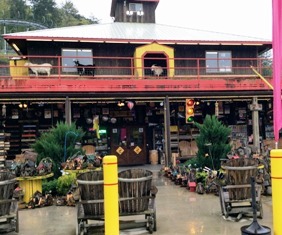 The entire family will enjoy seeing and feeding the goats, enjoying shopping, eating delicious treats, mine for gems, and more. The most popular attraction here (besides the goats) is the mountain coaster! It's an awesome "thrill" ride seating 1-2 people and goes just under 30 mph. Mountain views are spectacular as you move at your own speed for the ride of your life. Enjoy winter year around inside this delightful 35,000 square foot indoor amusement park! It's the first indoor snow facility in the United States! This winter wonderland offers 15 lanes of snow tubing, and a state-of-the-art "SnowPlay" area for building snowmen, creating snow angels, and more. 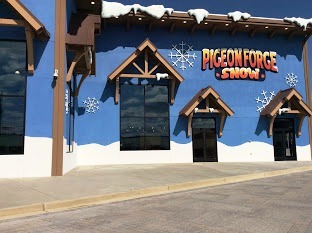 Pigeon Forge Snow has a second level with a snack bar and an excellent view of the tubing lanes. This unique adventure offers the thrill of a lifetime for the whole family! 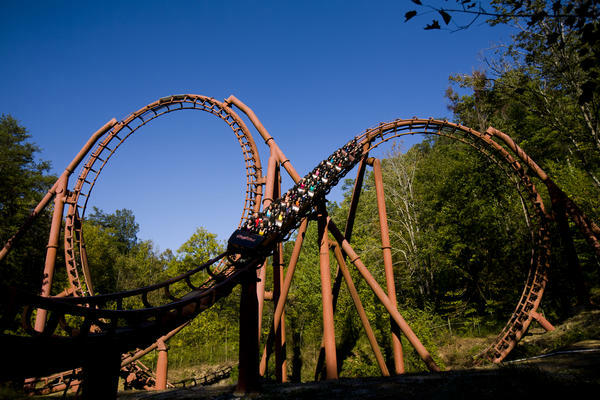 These are only a few of the many attractions you'll find here in the Smoky Mountain area. Discount tickets are available for these attractions and more. Just click here. "Amusement" comes in all shapes and sizes around here! It's found on every corner. If you're searching for fun things to do, my Activity Holidays page offers great ideas for every season. Whatever you choose to see during your vacation, you can be sure it'll be a great "ride!"